Prostrate evergreen perennial, up to 10cm high, native to eastern North America; slender rhizome with the smell of ginger; stems short, developing in spring, each branch with one leave; leaves dark green, reniform (kidney-shaped), downy at both sides, 5-20cm across; flowers on short stalkes near ground, solitary, dark purple-brown, campanulate; fruit a coriaceous, 6-celled capsule. In 2010, the use of all plants belonging to the Asarum species in drugs was banned in Germany by decree of the Federal Institute for Drugs and Medical Devices (BfArM). The cause of this was the detection of aristolochic acid I in homeopathic mother tinctures of Asarum europaeum with approximately 0.044 to 0.13 ppm, and of Asarum canadense with approximately 127.4g/kg (about 0.13 ppm). Methyl eugenol was the main component of the rhizomes essential oil (38.5%), followed by linalool (19.4%) and α-terpineol (5.9%). Minor compounds were 1,8-cineole (0.3%), terpinen-4-ol (0.5%), nerol (1.2%), geraniol (3.6%), neryl acetate (1.4%), elemicin (1.1%), methoxyelemicin (0.6%), 5-epi-7-α-eudesmol, and (E)-isoelemicine (1.3%). 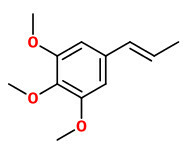 Methyl eugenol was the main products in the rhizomes essential oil, (E)-isoelemicin was the main product extracted from the roots (ca.20%).